We reached the funding goal in under 3 days!! Thank you guys!! ●	More than 6000 minutes of challenging enigmas and interactive adventures. The goal is to decipher the mystery of 'Arcanum Arcanorum', the Secret of Secrets, the unique item that will change the destiny of humankind. ●	You will use latest generation technology: virtual reality, augmented reality, graphene, 3D printing, NFC chips and more. ●	All those who complete the game, regardless of how long it takes them and what methods are used, will gain access to an epic VR finale and a special international event (streaming & physical location, gifts, surprises, etc). ●	“The Enigma Box” ® is just the beginning, we will launch new challenges which will arrive in your email and which you can download for free to use with your box. Some of the new extensions are available now. ●	This challenge will boost your dexterity and intuition; it will increase your understanding of the world and next-level thinking; enhance your knowledge and your skills; expand your contacts and, most of all, you’ll have a great time! We have appeared and been referenced internationally across social media and the press. Our investigations and projects have been shared millions of times around the world. We invite you to discover an odyssey in a world full of plots and enigmas. An intense experience which will take you to a multitude of incredible places around the world, without even leaving your front room! Your goal is to discover the 'Arcanum Arcanorum', the Secret of Secrets. ●	The Box: The box itself holds all elements of “The Enigma Box” ® challenge you will need in the game. It also hides secrets and components which you need to discover and which support other enigmas. It contains the necessary tools that will help you at all times and that will guide you when lost. It will shed light on how to progress. ●	Welcome pack (Card and letter for The Rhomb society): The first thing you see will be the welcome letter. A numbered card which gives you immediate access to “The Rhomb” ® society and its discoveries and secrets reserved exclusively for members. We will provide you with codes to access the site and app so that you can begin to unlock 3D scenes and virtual objects with your phone (iOS or Android). ●	Booklet: The Arcanum book is a key element. Here you will find instructions on how to advance in the game, hints, images, exclusive information and everything else you will need in order to complete the adventure. ●	More than 60 riddles and puzzles: The box contains over 60 riddles hidden in its compartments, including the Kit Card, Substitution Enigma, 3D puzzles, Scylates Cylinder, Chinese Shadows, and many more you have never seen. You will need to discover and resolve these either on your own or with your team. ●	Virtual Reality glasses: One of the important elements of the game is the opportunity to 'travel' to real places around the world. Thanks to VR glasses and the app on your mobile (iOS or Android), you will be able to unlock scenes using coordinates and key codes. Each unlocked set of coordinates will allow you to access a specific place where you can investigate different scenarios. When using your goggles you will be transported there with 360 degree vision, being able to look all around you, seeking clues and riddles to move the adventure forward. This is the first time ever that anyone has used this technology to create a 100% real and virtual game to progress in a unique adventure. It is a never seen before experience! ●	Board Game Map with exclusive physical and virtual contents: All great journeys and amazing tabletop games need a map and a table. In this case we have created a special map where you will find riddles and clues, see 3D elements through your mobile app, and locate physical figures with which you will build or depict diagrams. This is your base of operations, which will help you to move around the world trying to find the 'Arcanum Arcanorum', the final secret hidden beneath the history, alchemy and astrology. ●	Secret Code T-Shirt and “The Rhomb” Pin: Belonging to “The Rhomb” ® society also means wearing the distinctive emblem. The pin will help you stand out and allow you to recognize other members involved in the hunt with whom you can share experiences and knowledge. The T-shirt is not just an emblem, it also hides diagrams, secrets, and riddles. It includes a virtual image which you will only be able to unlock by viewing it with your augmented reality app. ●	Tool Box with compartments, codes, tools and secrets: From time to time you will need tools to help you progress through challenges, so we have supplied you with some useful items: an extender with tools including a magnet, a LED light, a ruler and a balance. ●	Metaphysical and Alchemical figures: We have prepared a series of figures which will assist you with the challenges, some of them are alchemic figures with symbols you must align, others have historical references, but they all have a purpose that you must discover in the game. At the end of the campaign we will offer some extra items: t-shirts, extensions, pins, etc. For those looking for even greater prestige and fame, and to deepen their knowledge with exclusive information, we have designed the “Enigma Box Deluxe”. This is a limited version: no more than 1033 units will be available! Christmas Gift included in Deluxe Edition!! - Welcome VIP card and VIP membership card: Exclusive access to experiences, demos and events. - VIP membership certificate: Access to discoveries far sooner than anyone else. - NFC ring to contactless unlock content. ●	Documents: Unpublished images and photographs from the discovery of the box and its opening. Previously unseen 360° VR scenes: With new clues and content. The objective is to find the 'Arcanum Arcanorum', the Secret of Secrets, hidden in a specific place in the world and kept there by powerful groups and secret societies. To do this you have “The Enigma Box”, which contains the documents, maps, riddles, and materials you will need to find this secret. You will also need to apply your ingenuity and investigative skills to advance in this adventure, either on your own or with companions who may join you in your quest. You will also make use of the most advanced technology in the fields of virtual reality and augmented reality, objects designed with graphene, and content stored in NFC chips. We are offering you a type of a game never seen before, a radical change in the way you experience a unique adventure from home. You can either play on your own, supported by your friends or with anyone you consider fit to face the challenge. We have combined an incredible story based on real events, comprising a gripping atmosphere, the most astonishing riddles, the most advanced technology, and the possibility to become a part of history. Of course you will be able to make safer progress and enjoy your experience more if you are accompanied in this journey by friends, as together you can support each other when you are stuck, exchange different perspectives, and discover clues that you may have missed. We have prepared a grand finale which will give you exclusive access to new information and new experiences. Only the chosen ones can reach the end and access the 'Arcanum Arcanorum', the Secret of Secrets. Will you be one of them? To reach the end you must face the greatest Multiple Enigma of all time, decrypt riddles, solve cryptograms, and test yourself. Each of these challenges will allow you to unlock coordinates to different places in the world, all accessible through your VR glasses. You will really believe you are there, thanks to the incredible technology and VR glasses, allowing you to access subterranean crypts in medieval castles, empty beaches surrounded by dangerous jungles, or the bustling, mysterious streets of Marrakesh. All without leaving your house. You will feel like one of the greatest adventurers of all time, travelling the world hunting for clues. You really will enjoy our experience, with each new destination providing access to a virtual place, where you will find clues and riddles. This is just the beginning, as the box and its mysteries will continue to support your progress, allowing you to find the next coordinates you will need to find the next place to visit. 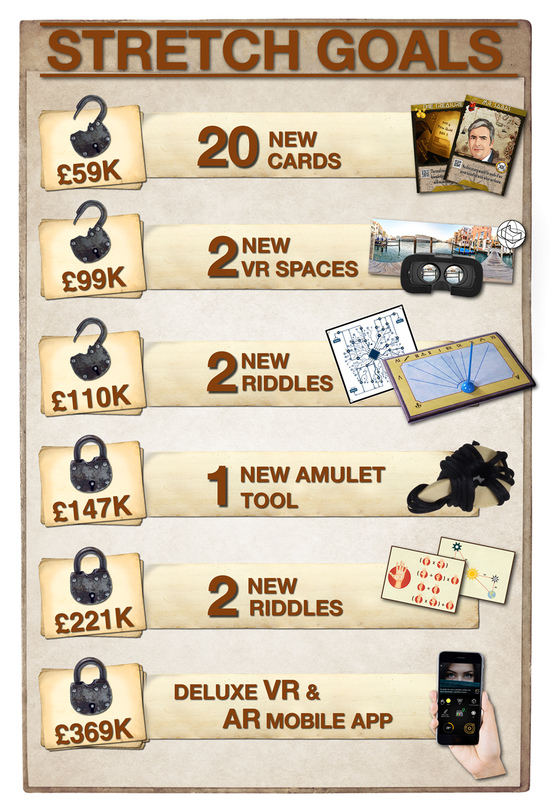 The box together with the riddles contained in it and the virtual worlds you can access (using your computer or smartphone) will all allow you to find coordinates and key words which will help you progress in the adventure. The booklet in the box will guide you through each location in the world so you know exactly what it is you need to be looking for and which enigmas may be part of it. Not everything is important. You need to find the exact combinations of objects, riddles and information to make progress. Once you have all the numbers for a coordinate, you must enter them in the app or via your computer. This will unlock a new spot in the world which you must investigate through virtual reality, counting on new content made available via augmented reality. Your new objective is to find the place in the world which will unlock the next clue, using the 360º VR contents and the riddles in the box. You must progress through the most mystical and mysterious places on the planet until you find your final goal and discover just what the 'Arcanum Arcanorum', or the Secret of Secrets, really is. What languages are available for The Enigma Box? You will find the instructions, Booklet, welcome pack in English, Spanish and French. Everything that is necessary to follow the challenge. The game is very visual and you don’t need to use the language a lot, but some riddles and puzzles will have a few words in English (only). Enigma Box challenge's final goal is Arcanum, which can be achieved by solving many puzzles, riddles and enigmas. All those who complete the game by the closing date (May 31, 2019), regardless of how long it takes them and what methods are used, will gain access to an epic VR finale and a special event (streaming & physical location). Are you going to miss out on all that? We want to thank our backers for their support when we reach specific goals, so we will establish a system of unlocking new challenges, pieces, riddles, and 360º virtual spaces. This will enhance the experience and add a new dynamic to the game. “The Enigma Box” ® is just the beginning of a series of new and amazing extensions and sequels. From “The Rhomb” ® we will launch new challenges which will arrive in your inbox and which you can download to use with “The Enigma Box” ®, as it already includes enough elements and components to be used as a toolkit for solving new riddles. Besides these challenges, we will launch new boxes and extensions in the future. ●	Extensions: We are brainstorming boxes which will contain new riddles, 360º settings and virtual objects for augmented reality, based on other challenges and investigations. Some will arrive in the following months and are based on ancient cultures, like the Egyptians, or hunts for lost treasure such as the Holy Grail and those found in the tomb of Genghis Khan. ●	New boxes: Once the final challenge in “The Enigma Box” ® has been discovered, we will not stop. We have a road map for the years ahead when we will create new boxes, which are not just there to develop history but also to enable you to acquire new skills and grow in many ways. We are fast approaching Christmas. Sadly, “The Enigma Box” ® will not be available for these dates. However, we are offering the exclusive option of letting you gift this game to a loved one. Order the “Christmas Enigma Box” pack, and you will receive the box on the date we have mentioned (Estimated as May 2018), but we will also send the gift recipient a special card complete with a welcome note, a gift, and a riddle! The Christmas Gift is included in the Deluxe version. We would like to reveal our secret Christmas Gift.. But only a bit so we don't spoil the fun behind it...A mixture of augmented reality, virtual reality, 3D printer technology, plus a few more surprises!!! Oh, and the amazing final of course..Sounds good? Are you ready for your first challenge with The Rhomb this Christmas?? New technological trends herald great changes in the world around us, especially when it comes to investigation techniques and video games. This is why we want to use these developments to create a unique adventure, letting you experience something special, something new, never seen before. ● Rhomb Evolution: to track gameplay progress. ● Virtual map: to visualise unlocked points. ● Secret library: Exclusive material and top secret contents belonging to the society. The app will be compatible with Android and iPhone devices and can be downloaded from the main stores with updates depending on how the game and its extensions develop. We want you to be a part of this great revolution, taking up great challenges and discovering knowledge and secrets that have been buried for millennia. To do this we need adventurers, explorers, gamers, and people of all backgrounds who are prepared to immerse themselves in “The Enigma Box” ®, which is not only a game, it is also a great experience. As you can see from the videos and images, we have a box: “The Enigma Box” ®, which is fully functional. We have designed all the documents, pieces of art and riddles. We have also developed 3D and augmented reality technology for fully interactable virtual reality objects. We have closed a deal with different manufacturers and providers outlining the start of production with moulds and templates. Production of the box is not a problem, in addition to the money accumulated from Kickstarter, we can count on access to various venture capital funds to allow us to create an even higher quality experience. The box will be limited to this campaign and we plan to offer additional purchases in the next months at a 35% premium on the initial campaign offer. This guarantees that the adventure and the objects of the box remain exclusive for a long period of time. You will be able to access new extensions and we will offer new games during the following months, so that the box remains entertaining, and you can have great fun and experience personal growth within it. We only have to produce and create the number of units which this launch will gather. We plan to make first deliveries tom our customer in May 2018. Today (November 29, 2017) we visited our manufacturer to check the progress of the box production. All going fine! And we also have the first shots of our special Christmas gift. Until today the membership of “The Rhomb” ® was carefully curated with specific functions for specific objectives. Members come from different countries, cultures, and backgrounds, such as universities, exclusive clubs or investigation centers. We always rely on the latest technology to discover advances in history, which had been unresolved and unexplained. This project is launched with the support of teams from London, Madrid and New York. We have been receiving help and guidance from chief experts in the field of historical challenges, explorers, high calibre designers, engineers, technologists, scientists. We have counted on international investment companies to back the project and make it a guaranteed success. At “The Rhomb” ® we have a passion for a job well done. We take pride in our finished product and aspire to reach the highest standards in quality having meticulously paid attention to the finest details. Each piece is a carefully designed and crafted component of the box and presented as a work of art; when completed all parts together will make a masterpiece, an object that really should be displayed in a museum... which is in fact precisely what we did with “The Enigma Box” ®. We are experts in adventures, challenges and designing logic games. Our team has years of experience in graphic arts and some of them are international leaders where it comes to designing new technology. We count on respected historians who have unveiled new tests, documents and have moved forward to amazing discoveries which have not even been made public yet. This combination of people and factors makes “The Enigma Box” ® a challenge that offers a unique experience exclusively available via Kickstarter. We believe this will be the next big thing in entertainment. Our goal is to make this one of the most amazing campaigns ever launched on this platform. Will you help us create this challenge? The Enigma Box™ - The Board Game has been developed by The Enigma Box Ltd with full support and licence from THE RHOMB. Products presented on this Kickstarter page and during the campaign may be subject to change in order to meet the expectations of the The Enigma Box Ltd licence agreement. Currently we have designs for all components, and have identified existing technologies we can use. Obviously, we are still missing some features that need to be completed and fine tuned. For example, we need to adapt all the 360º images and incorporate new elements into our augmented reality. The hardest part is done, however, as plans and materials are ready for mass production. Our box has a variety of materials and objects and should any not be available when production begins, be it due to lack of stock or discontinuation, it will be replaced with a similar item. We have estimated the delivery for May 2018 but please understand this is only an estimate. Due to the global logistics involved in shipping, some regions may receive their pledges sooner than others. We are prepared with our production as much as possible, however we will refund pledges if for some unforeseen reason the game cannot be delivered at all. We will be unable to refund the charges incurred by Kickstarter and Pledge Manager or other charges for your payment (PayPal, VISA, credit card...). This represents approximately 15% of the full payment. All pledges can be refunded up to 15 days after the end of the Kickstarter campaign. We will be unable to refund you the charges incurred by Kickstarter and Pledge Manager or other charges for your payment (PayPal, VISA, credit card...). This represents approximately 15% of the full payment. After we have started the packaging and shipment process (around 6-8 weeks before the actual shipping date) we will no longer be able to proceed any refunds. This project is being funded in GBP and any refunds will be also processed in GBP. We’ve been consulting our manufacturer and shipping company about reducing the box's weight to keep the shipping costs down. In order to make sure that these costs are as low as possible we will be charging shipping after the campaign ends. Backers will gain access to our Pledge Manager by email roughly two months after this campaigns completion. Below are our initial rough estimates of shipping costs of the core game. These costs may rise due to weight increase when more items are unlocked via stretch goals and when extra purchases are added to the box. OTHERS: Shipping cost to other countries will vary depending on the area. Unfortunately, due to customs regulations, we are not able to ship to Russia, Afghanistan, Ukraine or Kazakhstan. You agree that our responsibility to you is to ship your order as entered into our pledge manager system, that title and risk passes to you upon delivery to a common carrier for such shipment, and you are responsible for import duties or any other duties that may be payable to the relevant tax authorities, providing correct address information, and ensuring this address is deliverable by normal methods. We regret that we are unable to ship to PO Boxes.